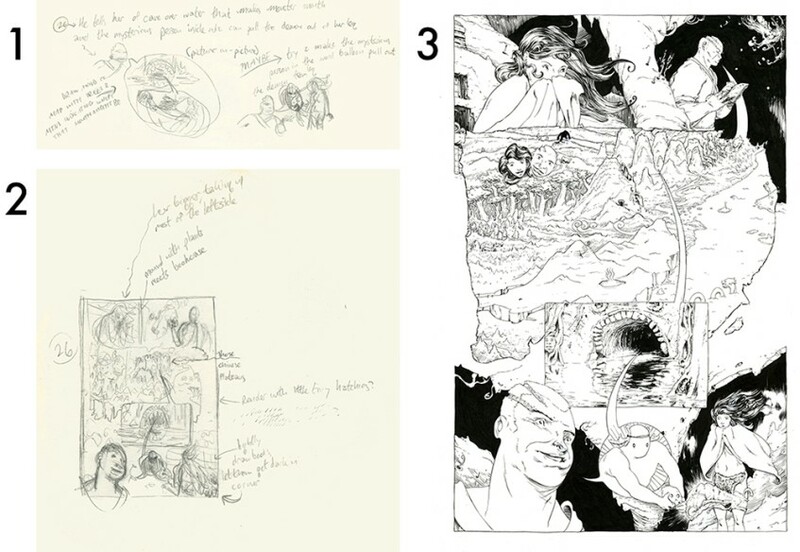 The acclaimed cartoonist walks through his visual technique for Mirenda, an intoxicating fantasy about a young woman struggling to exorcise a demon from her leg. Originally serialized in the Island anthology over five issues, Mirenda is a project that embraces everything beautiful about the comic book medium. You can count the number of times writer/artist/colorist Grim Wilkins uses words on one hand; the majority of the narrative relies purely on clever visual storytelling, allowing Wilkins to navigate each layout like an elaborate optic puzzle. This approach fills word balloons with pictures and intertwines panels, often resembling an ornate mandala or Russian nesting dolls. The plot appropriately also revolves around people and objects intertwined in one another. 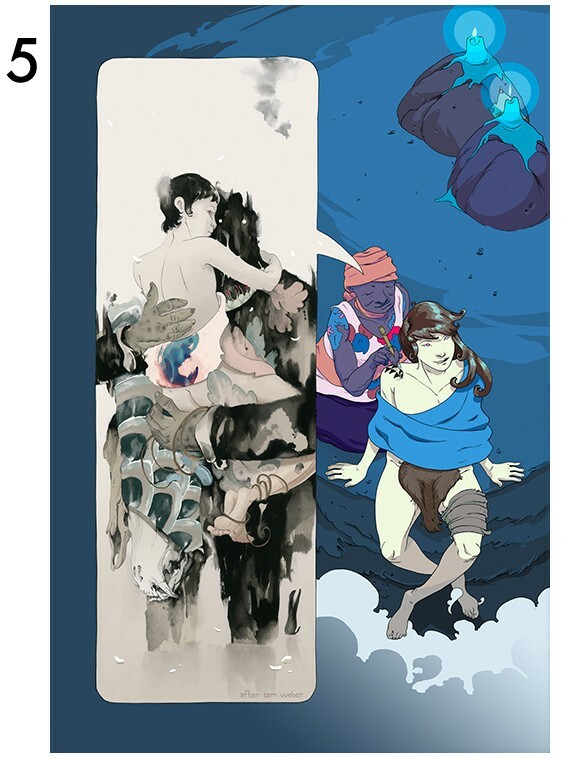 Within the opening pages, a female hunter-gatherer delivers a vivid blue flower to a local shaman, only for the medicine man to summon a grotesque demon. The woman conquers the monster, but the confrontation ends with a different foul creature burrowing into her leg. Wilkins and the nameless protagonist embark on a vivid, high-fantasy trek over verdant jungle forests, milky steppes, and amber desert cities. Throughout, the hero searches for anyone who can liberate her from her demonic stowaway, while other characters hunt and demonize the hero. 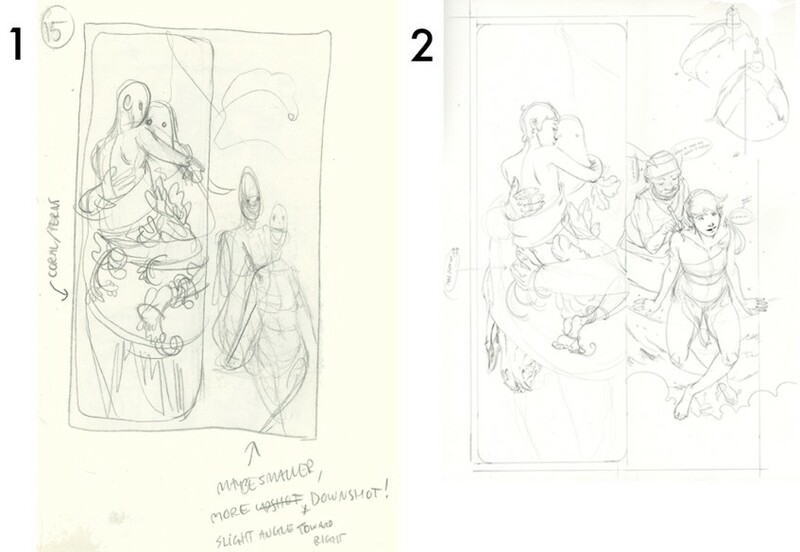 In this feature, Wilkins walks through his art process for this singular project. Mirenda is an accumulation of things that have always interested me as an artist. For as long as I can remember, I’ve been enamored with making comics that push beyond typical panels and word balloons, and I looove the idea of making a comic that can be read by anybody, regardless of the languages they speak. Combine these with a fondness for the natural world as well as ancient, fantastic civilizations and you’ve got the fundamental elements of Mirenda. While developing Mirenda's pages, I tried to make scenes that are as visually interesting as possible, without making them so complicated that readers can’t follow the story. As readers make their way through the book, they will become familiar with new storytelling techniques and be ready to take on more challenging pages later on. With any luck, readers will be willing to flip back through the book to find treasures they missed the first time. 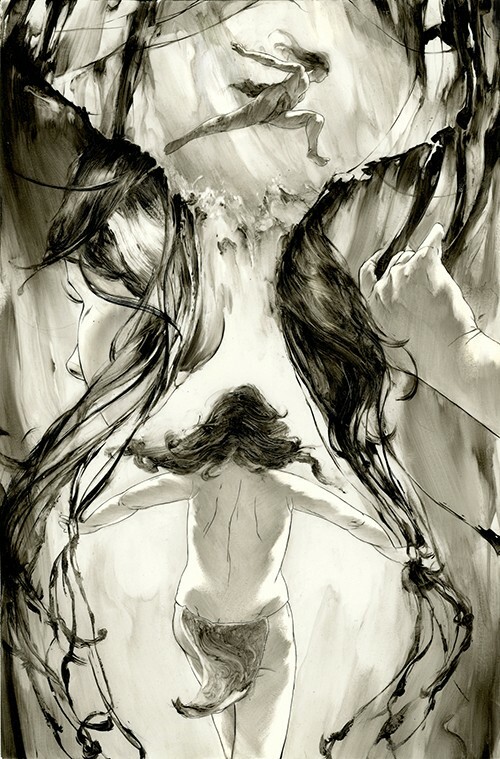 The opening pages of Mirenda were painted with a strange combination of ink and acrylic media that I had been cooking up over years. I painted my previous graphic novella (Love Story In The Woods) with this technique and, while it could make some great textures and neat effects, I was feeling its technical limitations. I couldn’t imagine painting a city scene with that goopy grey mixture. 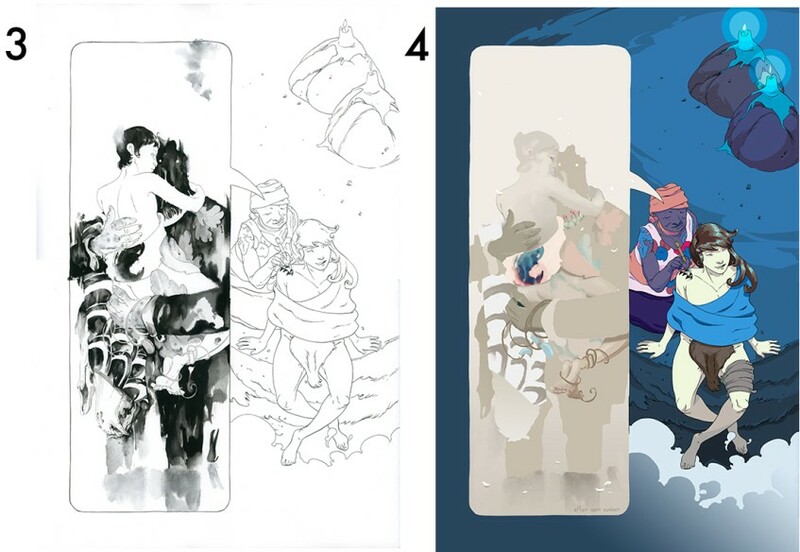 So the first pages of Mirenda #1 were a personal farewell to that style of painted black-and-white comics, and the beginning of a new world of color. By this point in the book, we have seen a few word balloons containing pictures instead of words. They were pretty simple—asking about an injury, describing a skeleton monster, etc.— but this page has the first big challenging one. It sets a precedent for the wacky word balloon things readers will see as the book goes on. Looking at my old notes, it seems like I put this page together without any trouble. I had a one-sentence outline of the page, followed by a couple of tiny sketches and a good thumbnail. (I don't have any evidence, but I'm guessing that drawing and inking the page went super, super smoothly.) The colors in the underground pages actually started as red and orange before I changed them to their final purple and green. I colored the map and the mouth-cave fairly true to life, but made the little character with the horns pink and faceless to reflect how obscure their description was. That ambiguous description sets in motion one of the great quests of the book! I’m a big fan of doing studies of artwork that I like and seeing what I can glean from it. There’s an old picture by Sam Weber that I’d been wanting to do a study of for yeeears but never got around to it because I wasn’t sure if I had the time to do it or the technical knowhow to pull it off. So when I wrote Mirenda #4, I made sure it was in the script. All of Mirenda has been venturing into the deep end of the pool where I write things that I want to see instead of things that I’m already good at drawing. I painted the panel above with black gouache because I knew I could make some good textures without any trouble. After scanning the page, I opened it in Photoshop and started cutting out portions of the painting to digitally recolor them. 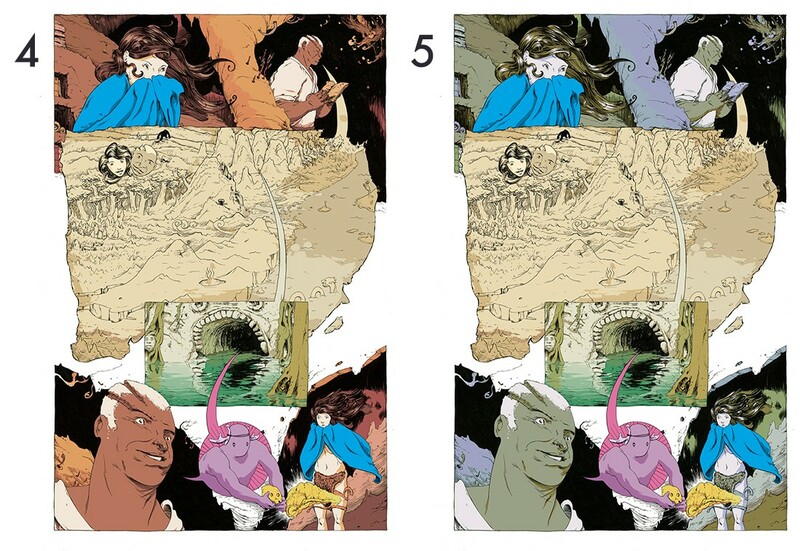 It was important to get most of the colors as close to the original Sam Weber picture as possible so that I could see how different they were from colors I would normally use. I love seeing how subtly the colors change beneath the black paint; left to my own devices, I probably would have made everything bright pink and green. All of Mirenda has been venturing into the deep end of the pool where I write things that I want to see instead of things that I’m already good at drawing. 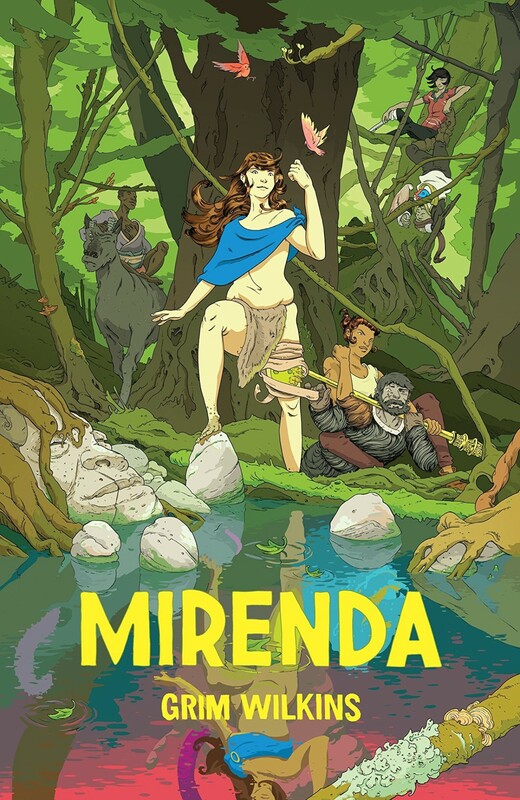 Mirenda by Grim Wilkins is available in comic book stores now.